Heywood Hardy English 1843-1933. Was an accomplished painter & etcher and illustrator of a variety of animal, hunting and coaching scenes, sporting subjects and genre pictures, principally with an 18th. cent feel. His portrayal of dogs and horses was perceptive, and they were well drawn and strongly painted He was born in Chichester, on 25th November 1842, son of the artist James Hardy, Snr (1801-79) and younger brother of James Hardy Jnr (1832-89). Hardy left home at the age of 17, and attempted to earn a living by painting animal pictures. He did this successfully and, after a short time with the 7th Somerset Volunteers, he borrowed some money from his brother and travelled to Paris. In 1864 he entered the Beaux Arts to study under the battle artist, Pielse. He returned to England in 1868 and found he was in great demand. He was often invited to country estates to paint portraits, sporting pictures and animal studies. Hardy continued to enjoy commissions for portraits, animal studies and hunting scenes, but he decided to concentrate on painting genre subjects. In addition, he provided illustrations for magazines such as the Illustrated London News, and The Graphic, as well as producing etchings of his work. Plate size 18 x 27 1/4 “ (45.7 x 69.2 cm.) 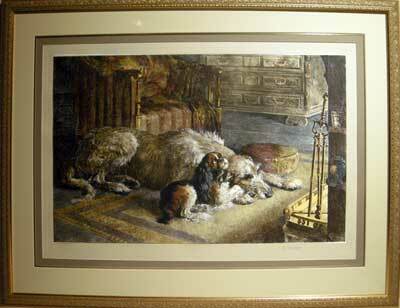 Frame : 28 x 36 1/2"
Herbert Thomas Dicksee (1862 - 1942) Was a London based, painter, etcher and mezzotint engraver of animals and genre with a special interest in wild animals. He studied at the Slade school.and later taught drawing at the City of London school. Based on his own observation and study lion, tiger and leopard subjects are particularly powerful. 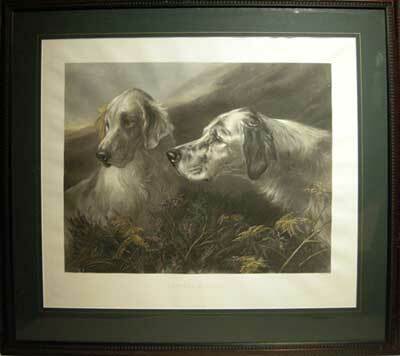 Also many appealing etchings of dogs and historical subjects after his own designs and those of his contemporaries. He worked with his brother, Sir Frank Dicksee on etchings of his paintings. He exhibited at the RA. and was a member of the Royal Society of Painter-Etchers.